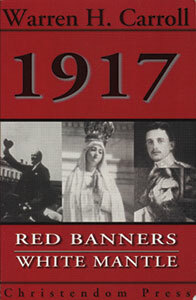 Since the earliest days of the Church, there has been no date more crucial to universal Christendom than the year 1917. We are still living the horror of the aftermath of the Communist rebellion; and, on the other hand, we are still living under the hope, yet to be fulfilled, of Our Lady of Fatima's promises. 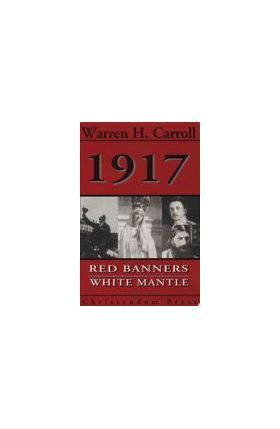 1917: Red Banners, White Mantle introduces these two principal world events of that year one heavenly, one diabolical; the consequences under which we still live. On the one side we see the unholy, Rasputin and Lenin, on the other we see the marshaling of the holy, under Mary, the enlisting of whose troops began with three shepherd children of Portugal. The scourge, in all its historical force and brutality, is vividly related against the backdrop of the healing remedy the old serpent spitting against the heel of the Woman about to crush his head. Few readers will put this book down before the story reaches its conclusion.